Doc Bayne has had his fair share of black bear encounters. 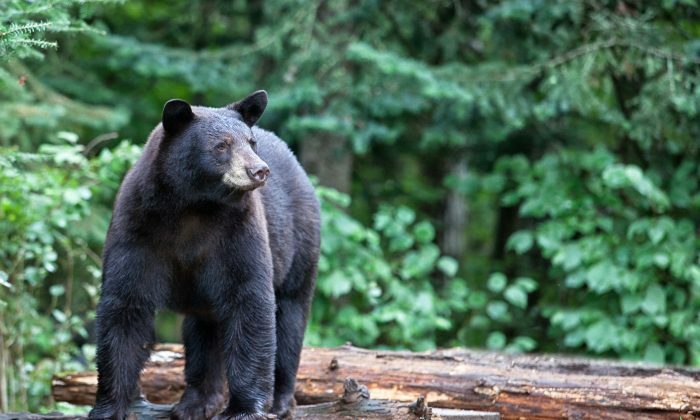 Black bears (Ursus americanus) that roam around in Orange County are the mostly vegetarian and least aggressive cousins of other members of the family—say, grizzly bears. Many people who live in small towns or villages have seen one and they are not hard to find, even though they usually avoid contact with humans. Epoch Times caught up with Bayne just before he was due to give a talk on “Living with Black Bears” in Tuxedo Park. He is a retired park ranger and acting environmental educator for Sterling Forest who has been hiking for 50 years. He has often gone on field trips with the New York State Department of Environmental Conservation to assist with the capture of bear cubs to take blood samples and do surveys. Naturally, his job has lead to a few close encounters with bears, which might sound a tad harrowing to big-city dwellers. “When I was working I would see a bear every three weeks,” he said. Bayne’s closest encounter with a bear was when a second-season cub, of about 130 lbs. came up to within an inch of him to take a whiff. The bear kept walking toward him and, after realizing that he’s only human, turned around and left. He also told of a more dangerous encounter when he jumped off a log within two feet of a bear. They both got a shock, which explains why Bayne’s knee-jerk reaction was to run—something that he knows and educates people not to do since a bear will chase anything that runs. The bear chased Bayne for about 50 feet at which point Bayne remembered what he should have done. He turned around and yelled at the bear. Luckily that was enough to put to end to the chase and leave Bayne unscathed. When he retired in 2011 they did not rehire an educator for Sterling Forest. Bayne took the bull by the horns and formed the Friends of Sterling Forest group. They work with New York state and organize lectures and hikes every weekend. A bear will chase anything that runs. He educates people about the habits of these sizable furry creatures, emphasizing that as we encroach on the wilderness, bears are likely to come into contact with humans. But it seems that mostly young bears and old bears are actually the ones who will venture into garbage bins—the young ones do it because they are inexperienced and hungry, much like teenagers who are continuously ravenous. The old bears do it because they are less nimble and look for easy, fast food. It wasn’t long after our landlord inaugurated the compost box that a young-ish bear decided to try his luck last fall. He took some vegetable scraps and stale bread while my husband and I were fumbling to find our phones and take a photo. It soon occurred to us that it was not the cleverest of tactics, mainly because we ran toward the bear, stopping within 30 feet—a distance, which we deemed safe enough so as to not get attacked. Later we looked up some bear speed statistics, which finally convinced us that what we did was decidedly less than intelligent. Apparently a bear can easily out-run the fastest human on earth. Nevertheless, it was a lovely and curious creature to behold. Bird feeders are also a favorite place for fast food. According to Bayne people should put out bird feeders only in winter because birds don’t actually need to be fed during the warmer months. He also said that a wild bear will not touch food that has human scent on it. The dangerous bears are the ones who are used to going through garbage cans because their familiarity with human settlements is what leads them there for an easy meal. But this is also why attacks happen as both human and bear may get startled by one another. Black bears are at the lowest end of the scale of aggressiveness. So even if you run into a female with cubs in the forest, it will mainly give warning signs by stamping her feet and make a peculiar blowing noise which, going by Bayne’s imitation, sounds like a very windy barking noise. We also discussed the Milford incident in New Jersey where a black bear mauled and killed a hiker. It was the only fatality in New Jersey in 150 years. The media reported that the hiker was carrying a granola bar. What the media did not report however was that the bear did not touch the granola bar, nor did it eat the hiker, but took enough of a bite out of him to kill him. Bayne is familiar with the report of that incident and he mentioned that the group of five hikers all had photos of the bear on their cameras, including the one who was mauled. The hikers that escaped reported that they each ran in different directions. The bear chased and caught only one of them. Judging by all the tried and tested methods of repelling a black bear, the hikers would have had a more successful escape had they stood their ground as a group in one spot. Bayne points out to keep in mind the bear’s perspective in all this. Walking up to a bear is encroaching on its territory. “After all, this is their home,” he said. Correction: In the May 8 article “Close Encounters of the Black Bear Kind”, Doc Bayne’s formal official tiles were park ranger and acting environmental educator for Sterling Forest, as well as acting historian. He retired in 2011. Orange County Epoch Times regrets the errors. With no natural predators or pressure from humans, black bears have made a precipitous comeback in the past few decades.